England's response to the Revolt of the Netherlands (1568?1648) has been studied hitherto mainly in terms of government policy, yet the Dutch struggle with Habsburg Spain affected a much wider community than just the English political elite. It attracted attention across Britain and drew not just statesmen and diplomats but also soldiers, merchants, religious refugees, journalists, travellers and students into the conflict. Hugh Dunthorne draws on pamphlet literature to reveal how British contemporaries viewed the progress of their near neighbours' rebellion, and assesses the lasting impact which the Revolt and the rise of the Dutch Republic had on Britain's domestic history. The book explores affinities between the Dutch Revolt and the British civil wars of the seventeenth century - the first major challenges to royal authority in modern times - showing how much Britain's changing commercial, religious and political culture owed to the country's involvement with events across the North Sea. Preface; 1. News from the Netherlands; 2. Histories and their readers; 3. The school of war; 4. The trade of merchandise; 5. The nursery to nonconformists; 6. Resistance and reform; Epilogue: the advancement of learning; Bibliography. 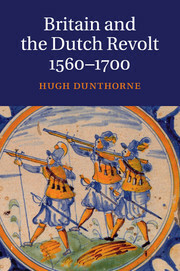 Hugh Dunthorne specialises in the history of the early modern period, the Dutch Revolt and the Dutch republic and empire, the history of war, and the Enlightenment. He was formerly Senior Lecturer in History at Swansea University, and his previous publications include The Enlightenment (1991) and The Historical Imagination in Nineteenth-Century Britain and the Low Countries (edited with Michael Wintle, 2012).